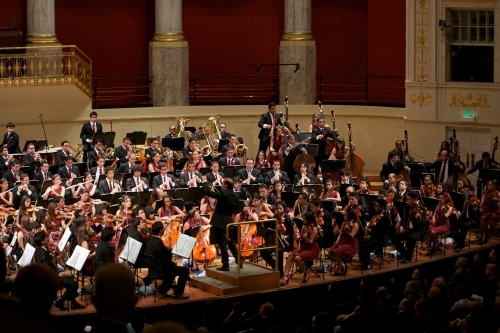 BONN, Germany , Oct 4 2012 (IPS) - Venezuela’s youth symphony orchestras that have enamoured audiences on several continents are a social programme aimed at fighting poverty and marginalisation, more than an artistic endeavour, says the founder of the initiative, José Antonio Abreu. The National System of Youth and Children’s Orchestras of Venezuela, known simply as “the system” or El Sistema, got its start in 1975 in a basement where Abreu began to rehearse with a dozen teenagers. Some 400,000 children, adolescents and young adults, mainly from poor families, currently attend the programme’s educational centres and take part in 90 preschool, 130 children’s, 288 youth and 30 professional orchestras and choirs. One of them, the Caracas Youth Symphony Orchestra, completed its fourth international tour at the Beethovenfest in Bonn, Germany on Tuesday Oct. 2. The orchestra visited six European cities, accompanied by Abreu, who at the age of 73 still appears to be everywhere at once, taking care of details in rehearsals, participating in international tours, and managing relations with the world’s leading musical centres. The charismatic Abreu, a musician, composer, economist and social visionary, has sat in parliament and served as minister of culture from 1989 to 1993. He is the patron of musical institutions in different countries, and has received numerous prizes and awards for his work. VENEZUELA: A New Life for At-Risk Kids, and Music Too! Abreu sat down with IPS during a break in the Caracas Youth Symphony Orchestra’s European tour. Q: If the system of orchestras is not only an artistic initiative, but a social programme to fight poverty and exclusion, how does it manage to simultaneously export quality music while defending the poor? A: That is our great challenge. To develop a musical system of extremely high quality, where excellence is the watchword, while at the same time guaranteeing that all Venezuelan children and youngsters from middle to low-income backgrounds have full, free access to this training. Q: Doesn’t that road to excellence mean playing the music of the elites? A: Music has to stop being an art for the elites, it has to stop being a monopoly of a small part of the population, and it must become universal patrimony, especially of the poor. And a culture for the poor cannot be a poor culture, but one of extremely high aesthetic level and extremely high pedagogical and social level. Q: But how do music and this system pull young people out of poverty, exclusion, their needs and problems associated with crime or drugs? A: At the very instant that a child is given an instrument and a teacher, the child is completely rescued, because an infinite path is opened up before the child – the path of art. Art means perfection, and the road to perfection has no limits. That is the path that opens up before a child who receives an instrument and a teacher, but the rest is up to us: providing the child with an education, adequate infrastructure, quality instruments, teachers, and encouragement to continue. Q: That is what you mean by rescuing them from poverty? A: That is it. Because poverty is not only material. The most terrible poverty is not being anyone. Mother Teresa of Calcutta talked about that a lot, about not having an identity, which is the most miserable poverty. The artist takes on a lovely identity in the eyes of society, and these children acquire that at a young age – with their uniform, their instrument, their orchestra, their concerts, they feel proud of who they are and of what they do, and they aspire to a better personal and collective future. Q: Nearly 40 years after you started this movement, how would you sum up what began as such a small initiative? A: Well, we now have a total of 400,000 young people and children involved, counting both the network of orchestras and the network of choirs. That is 400,000 families involved in this, which makes it a social project of extraordinary magnitude. And with the increase in the number of teachers, the construction of new centres, and the endowment of new instruments, there is no limit to how much El Sistema can grow. Q: Is it possible to develop other movements like this elsewhere in Latin America? Does your system of orchestras and choirs work with other countries in the region? A: We are already doing this. We are working with Peru, Colombia, Ecuador, Uruguay, Paraguay, Brazil, all of Central America, and Mexico, and also with Spain and Portugal, through the Ibero-American summits, with an orchestra of that bloc which has already begun to perform. And in the rest of the world, we have links to systems being created in Scotland, Italy, France and Greece – programmes of cooperation and exchange for young people in Europe. Q: Will this mean that more works by Latin American composers will be incorporated in the repertoire of the systems of orchestras? A: Yes clearly, because this is not just for young musicians. The programme is also for young composers, young creators. And the development of orchestras and choirs opens up enormous possibilities for musical composition. I am sure that in the next few years music in Latin America will have an immense creative splendour, because the young composers of today will be the maestros of tomorrow. They are steadily growing in both numbers and quality. Q: Are you ever criticised because of the abundance of pieces by European composers in the repertoire of El Sistema’s orchestras? A: This criticism comes out of ignorance and mediocrity – above all, it comes from a lack of information and culture. Because anyone who knows anything at all about us knows, for example, that El Sistema has a national programme dedicated exclusively to cultivating Venezuela’s instruments, the Alma Llanera Project. And a huge sum was just granted to expand the practice of Venezuelan instruments and national music genres throughout the country. The people who voice such criticism have not come to our concerts. Q: Do you believe the system is sufficiently established to continue when you and the team that has worked with you almost since the very start can no longer carry out the work you are doing? A: Without a doubt, because what we are doing now is training our replacement team. We are training the new generations. This Youth Orchestra is 22 years old, the Simón Bolívar Orchestra, the head of the system, is now adult, and all of its members are teachers. The expansion in the number of music teachers to which the growth of El Sistema has given rise is indefinite, and fully guarantees its continuity. Q: So it is a policy of the state, not of a government? A: Yes, it has been from the very start. The position of the state has been unchanging, guaranteeing the right of young people and children to a musical education. We see this as the exercise of a constitutional right of children and young people. And for that reason, the state guarantees it, as it guarantees secondary schools, universities or hospitals. These are established, deeply-rooted social rights, fixed and irreversible.